SmartPurger 3.8 is now released. 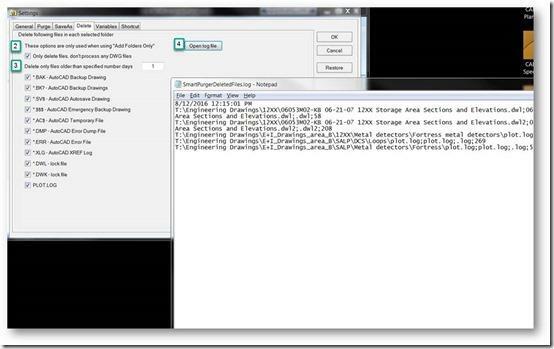 SmartPurger is a batch and script utility for processing multiple AutoCAD drawings with full control. 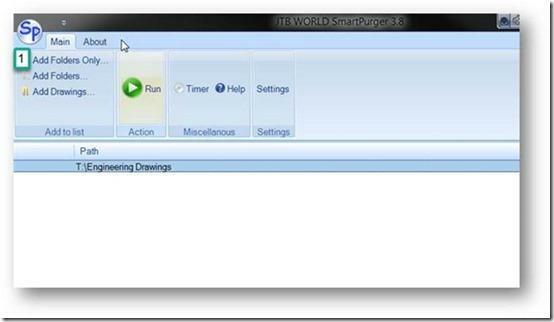 Execute LSP or SCR files on multiple drawings. SmartPurger handles crashes so the AutoCAD batch processing continues to the end and leaves bad drawings to be corrected manually. Many purge and cleanup settings available. SmartPurger can make use of AutoCAD Core Console that was introduced in AutoCAD 2013 making the scripting process faster then ever as the Core Console takes less than a second to open per drawing. -With this version it’s possible to only delete certain “garbage” files without having to also run AutoCAD to purge and process custom scripts. See the “Only delete files, don’t process any DWG files” checkbox on Delete tab in Settings. I received below screenshots and statement from Clinton Hill at Innophos. This functionality was added based on his wishes. These are the steps to take to only delete specified files with extensions like .BAK, .BK?, .SV$, .$$$, .AC$, .DMP, .ERR, .XLG, .DWL, .DWK or PLOT.LOG. First click on Add Folders Only and select one or many folders. Sub folders will also be processed. Next click on Settings and on the Delete tab check the “Only delete files, don’t process any DWG files” checkbox as well as what type of files you want to delete. Now go back and click on the Run button. When ready go back to Settings and click on Open log file to see what files were deleted. Download the updated version or a free trial here. The upgrade is free if you already have purchased a license.